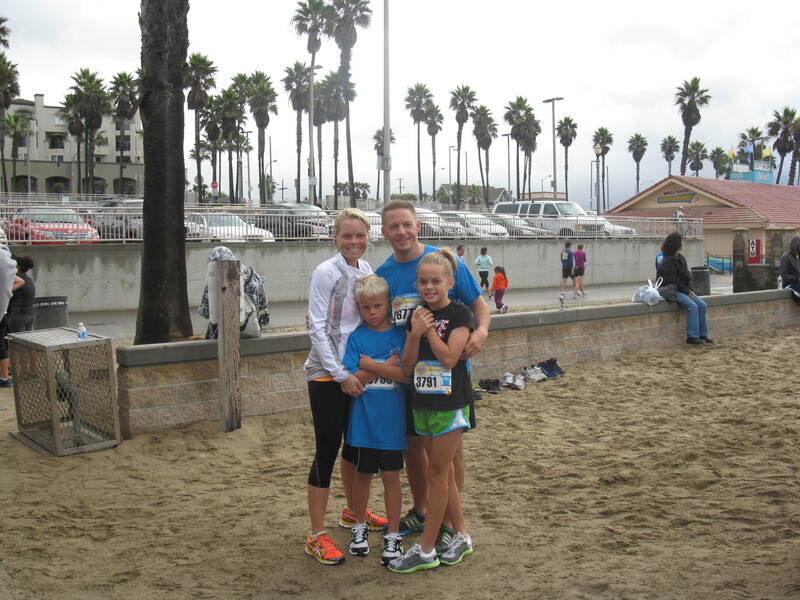 In 2010 I ran Huntinton Beach’s Distance Derby 10 miler in 1:08:14. This race stands as one of my very best races ever. Today I rode down with Chuck, Lance and his mom to see if I could break it. Of course the other, even bigger story of the day would be seeing just how fast Lance has become! Lauren was there as well, but she was under orders to take it “easy.” (On the way down, I predicted that she would run it “easy” in 75 minutes.) Here we are a few minutes before getting started! 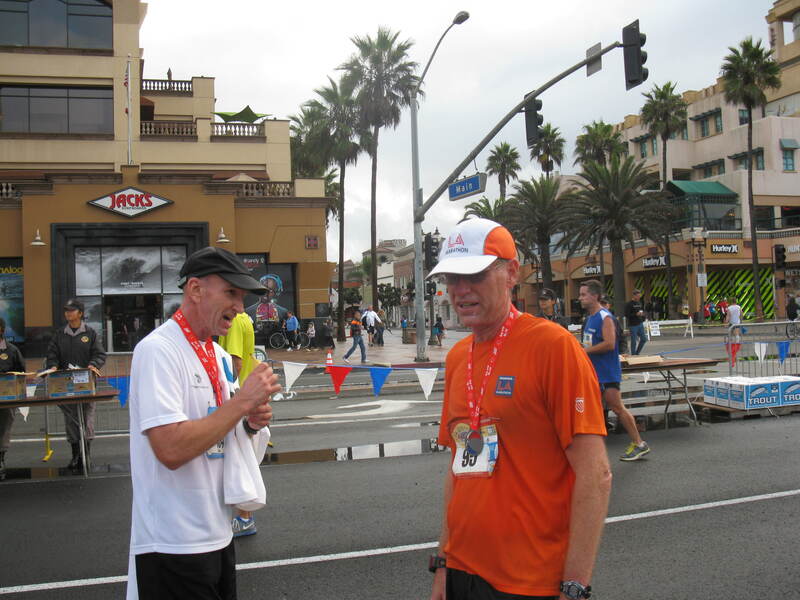 I set my Garmin Virtual Training partner for a PR time of 1:08:00. 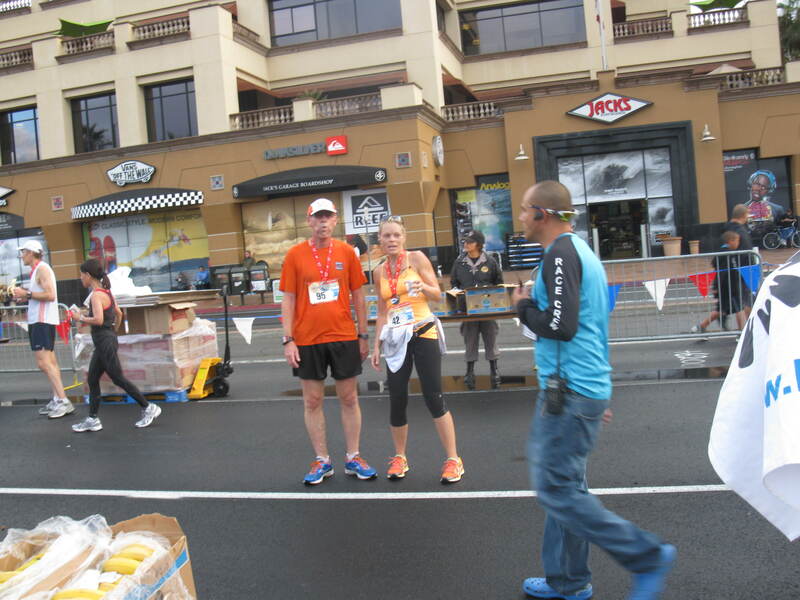 As the race started I locked in on that pace pretty comfortably. Lance was right by my side. I was right on pace according to Garmin, but it beeped off the first mile about 5 seconds before the posted marker. Our official first mile was 6:58. 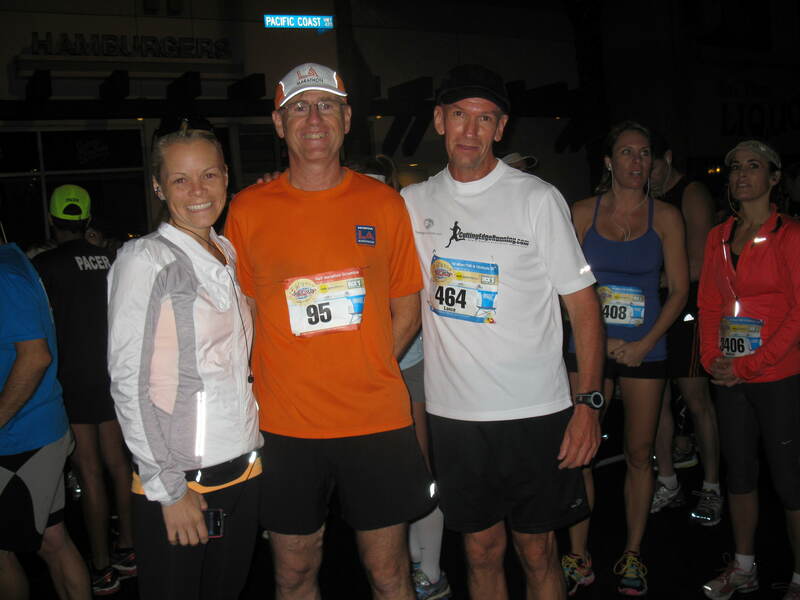 Sometime in the second mile I heard a voice say, “There’s Chuck!” It was then that I noticed Lauren was still with us. Chuck yelled out his encouragement as the three of us went by. Lauren dropped back a bit, but Lance and I hung together for almost 5 miles. Mile two was 6:58 and mile 3 was 6:58. Mile 4 included a pretty steep little hill. Lance pulled ahead going up it, I caught him coming back down. This mile was 7:01. In the 5th mile, though I could feel my quads starting to fatigue and I knew that a 10 mile PR was not going to be possible today. The 7:00 pace group caught us and I told Lance to go with them. Around the corner Lance was with them at 35 minutes for mile 5 and I was 10 or 12 seconds back. So, what about a PR? Well, the 10 mile race was only the first part of what they called the “Half Marathon Scramble.” Lauren and I both signed up to do a 5K obstacle course on the beach after the 10 mile race. They also offered a 2K beach obstacle course. Chris, Taylor and Jackson were signed up for this. 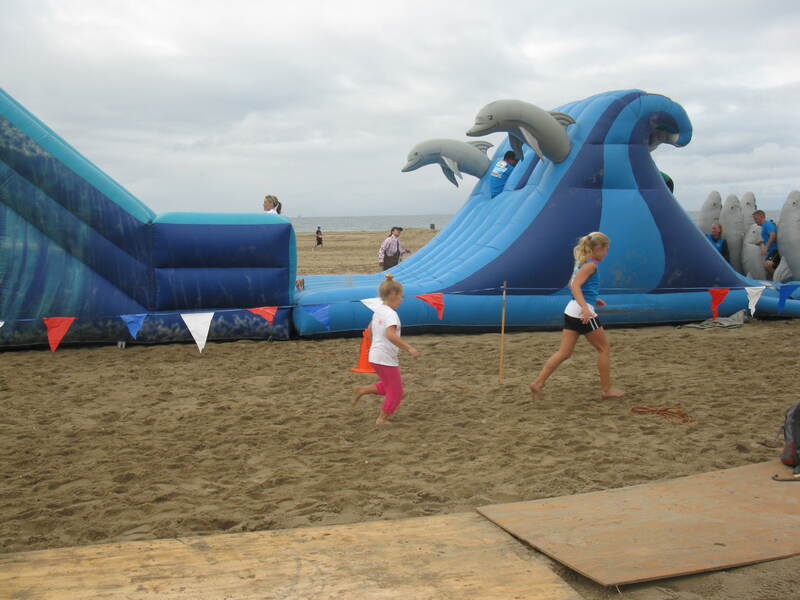 The obstacle course was arranged to start in waves. You got into the chute and took off when they said go. They released a wave of 2K runners and the Dukes were off. 5 minutes or so later I got started. I have only run one race on the beach previous to this. That race was an annual 4 mile low tide race in Long Beach. They run the race right at the water’s edge where you have half way decent footing. Today’ race, however, was way up away from the water where the sand is soft and deep. As my wave got started 2 or 4 other runners got out ahead of me. I quickly figured that the best running technique was short quick steps. I tried not to let my feet sink into the sand. This was not one of those flame shooting, mud crossing, duck under the barb wire types of obstacle courses. 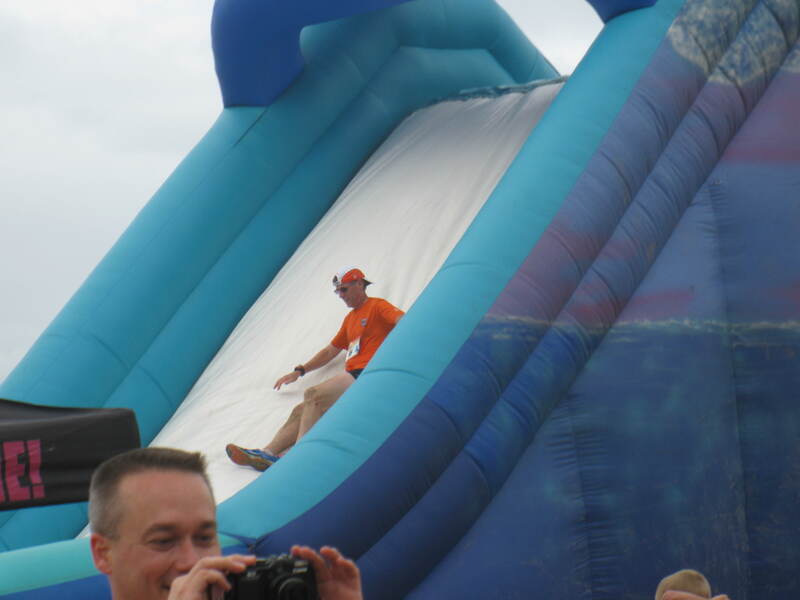 The obstacles included some walls to zig zag through, some barricades to hop over, some netting to crawl under, some surf boards to crawl under, a pipe to crawl through, some sand hills to climb over and one huge inflatable climb and slide thing. After working my way through the obstacles and after running through 3 miles of sand, I arrived at the inflatable obstacle to find a waiting line. My Garmin, which pauses when I stop moving had my time at 28:29. The official chip time which continued to run while I waited, was 43:22. So, no new 10 mile PR, but even with the delay I set my new 5K Beach Obstacle course PR! Oh, I could call it my new Half Marathon Scramble PR as well. Thanks to Lauren for taking and sending the video. Thanks to Julie for taking the photos! It was a fun day! Congrats on the PR! You were right on with your prediction of Lauren’s time and she was right on with the title of your post. Congratulations on your new PR. Knowing how competitive you are I am looking forward to the rematch with Lance in six weeks. I am sure that you are going to make the necessary adjustments in your training so as not to let him get away. The friendly competition is going to make both of you better. I enjoyed the pictures. On Tuesday morning I will give Lance your website address so his mother can see the pictures.